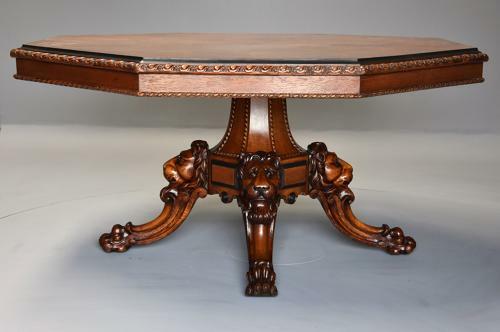 The table consists of a segmented pollard oak veneered octagonal top with ebonised moulded edge leading to a gadrooned and berry carved moulded edge with an oak veneered frieze below with a carved rope twist decoration. The top is supported by an impressive pedestal base consisting of an eight sided oak column with carved rope twist decoration leading down to four superbly carved lions heads with moulded panel in between, the outer moulding being ebonised with a circular ebonised paterae below. The table is supported by four outswept legs with scrolling carved decoration terminating with hairy paw feet and standing on original brass castors. The table top can either be tilted or remain down.